Once upon a time, I got a text message from a friend of mine. We live on opposite sides of the country so texting is the main way we keep in touch. Most of the time we talk knitting and yarn. She also reads this blog. After reading so many posts about my spinning and my ready-to-knit skeins of handspun, she asked if I had ever knit with any of it. A perfectly valid question. I referred her to Exhibit A, a pair of mitts knit from my first 3-ply yarn, and a shawl I was ripping out. Out of the dozens of skeins I’ve spun over the years, I’ve only knit with 2 of them. After I hit send, she threw down the gauntlet. Knit with my handspun or face the consequences. I’m not really sure what those consequences were, but I’m sure they were dire. I choose a freshly spun skein and went looking for a pattern. I had enough yardage for a cowl and eventually picked the Present Cowl by Mademoiselle C. The cowl was a quick knit where the handspun was the star of the show. I knit it up last year but took my sweet time to block it. Still wore it though with the ends tucked out of the sight. When I flew back to Birmingham for a visit, the cowl came with me so I could prove that I actually had knit my own handspun. Consequences averted. Whew. When I dunked the cowl into the water, I was curious if blocking would change the gauge and drape of the piece. Before knitting, the handspun got it’s own bath to set the twist when it came off the bobbin. Would that soak be enough to prevent changes in the knitted fabric? Nope. After blocking, the stitches noticeably relaxed. The fabric had more drape and the cowl grew taller and wider. It’s still the right size to wear without collapsing so I’m happy. The moral of the story is swatching is important whether you’re working with commercial or handspun yarn. 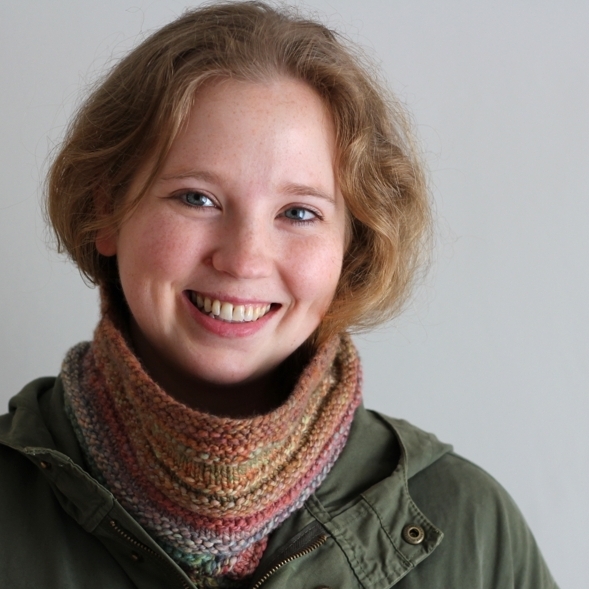 The finished cowl is warm, comfy, and looks great with my favorite coat. It’s also good protection from all the wind whipping through my neighborhood. Now I just have to wait for the temperature to get cold enough to wear it. Since knitting up this skein, I’ve knit one other project with handspun which I’ll be sharing soon. I also have my eye on another handspun skein that I wound but never knit. So, I’m passing the challenge on to you. Have tons of handspun that you’ve never knit with? Grab a skein and knit it up! The consequences of #handspunchallenge will be fun, wooly, and anything but dire.